In stock -This product will ship today if ordered within the next 10 hours and 51 minutes. 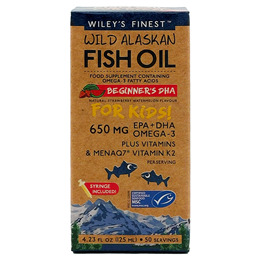 Wiley`s Finest Beginner’s DHA delivers nutrients that support the development of young bodies, including healthy eyes and vital immune function. Featuring MenaQ7®, an advanced form of vitamin K2 for optimal bone health. DHA contributes to normal brain development. Vitamin K is needed to build and maintain healthy bones in children aged 3 years and over. Purified & Concentrated Alaska Pollock (Fish) Oil triglycerides, Natural Strawberry and Watermelon Flavours, Identity Preserved Non-GMO Vitamin E (Sunflower), Vitamin K2 (MenaQ7®), Vitamin D3 in medium chain triglycerides. (Ages 1+) As a food supplement, take one ½ teaspoon (2.5ml) daily with food. Do not exceed the recommended daily dose unless advised your healthcare professional. Food supplements should not not be a substitute for a varied diet. REFRIGERATE AFTER OPENING: For optimum freshness once opened, store tightly capped in the refrigerator and use within 60 days of opening. Consult your family physician before using this product if your child is allergic to iodine, using blood thinners, or anticipates surgery. 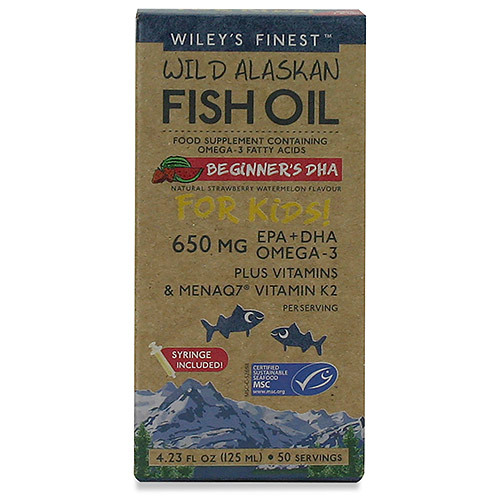 Below are reviews of Wiley`s Finest Wild Alaskan Fish Oil - Beginner`s DHA for Kids - 125ml by bodykind customers. If you have tried this product we'd love to hear what you think so please leave a review.